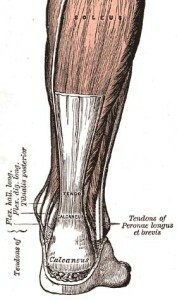 The Achilles tendon is the thickest tendon in the human body. If connects your calf muscles (Gastrocnemius, Soleus, Plantaris) to your heel bone (Calcaneus). These muscles work together to lift your heel off the ground (plantarflex). 2 common injuries that occur to the Achilles tendon are Achilles Tendinitis and Achilles Tendinosis. The key difference between these two injuries is that during Achilles Tendinitis there is active inflammation within the tendon. This inflammation is generally short lived, and if the injury is not cared for, the tendon will continue to degenerate which leads to Achilles Tendinosis. With either of these injuries, patients will feel pain, stiffness and may have difficulty walking. Patients can have either condition present in the belly (middle) of the tendon, or where the tendon actually inserts into the heel bone (insertional). In some cases degeneration of the Achilles tendon can lead to a tendon tear (rupture). The Achilles tendon can also rupture acutely during physical activity. Commonly patients will report hearing a loud pop and feeling like they’ve been kicked in the back of the leg when the injury occurs. Physical therapy treatment for Achilles tendon dysfunction can be very successful in reducing pain and restoring function. Exercises to stretch the calf, eccentric exercises to strengthen the calf and correcting any gait impairments that may have caused the injury are some of the most successful strategies. Soft tissue treatments like the Hawk Grips treatment we use in our clinic can also help accelerate recovery by improving blood flow to the tendon and to restore mobility. Rest, ice and taping are also additional options for the patient to help reduce pain. It’s important to remember if you are someone who continually suffers from Achilles tendon injuries, there is likely something mechanical that is causing your pain. Improper footwear and poor gait or running mechanics are often the culprits. So it’s recommended that you consult a physical therapist to correct the underlying issue if you are someone who has recurrent Achilles tendon pain or if you are having Achilles tendon pain that hasn’t resolved itself. About the author: Dr. Kevin Prue PT, DPT, CSCS is a graduate of Duke University’s Doctor of Physical Therapy Program. He is the president and director of Prue Physical Therapy & Sports Performance located in Cary NC. He specializes sports and orthopedic physical therapy, sports performance training and injury prevention for youth and recreational athletes.